Almost every high student must face a much-feared standardized test before college, and for the vast majority of students, that test is the SAT. However, in recent years, more and more students have opted for the ACT instead. In the last five years alone, ACT enrollment has increased 66% for east coast students, and 44% for the west coast, according to the ACT test board. Having choices is a good thing, especially when it comes to a test that can affect the trajectory of one’s entire academic career. Many students in California take the SAT because they may feel that the University of California system prefers that test. However, the UC system, like every major college in the country, accepts both SAT and ACT scores for their admissions and assures students that they do not prefer one over the other. The End Result provides tutoring for both the ACT and the SAT. We will highlight the main similarities and differences between the exams to help you decide which exam is best. Every student should give themselves plenty of time to prepare and take a practice exam before deciding. The ambitious may choose to take both, although it is not needed. With competition for a place in a top school becoming ever more intense, it can only help to have high SAT and ACT scores. The SAT measures student’s problem solving abilities. The ACT is an achievement test, measuring what a student has learned. 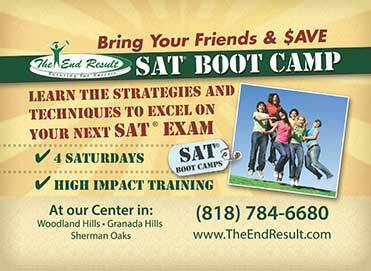 The End Result offers proctored exams, practice tests, boot-camps, and one-on-one tutoring for both exams.